This is my Pioneer LaserVision LD-V2000 LaserDisc player that I believe I found at the old State Road Goodwill some years ago. A few weeks ago on Record Store Day I visited Time Traveler in Cuyahoga Falls and was pleased to find a nice little LaserDisc section among all of the other myriad things in that store. 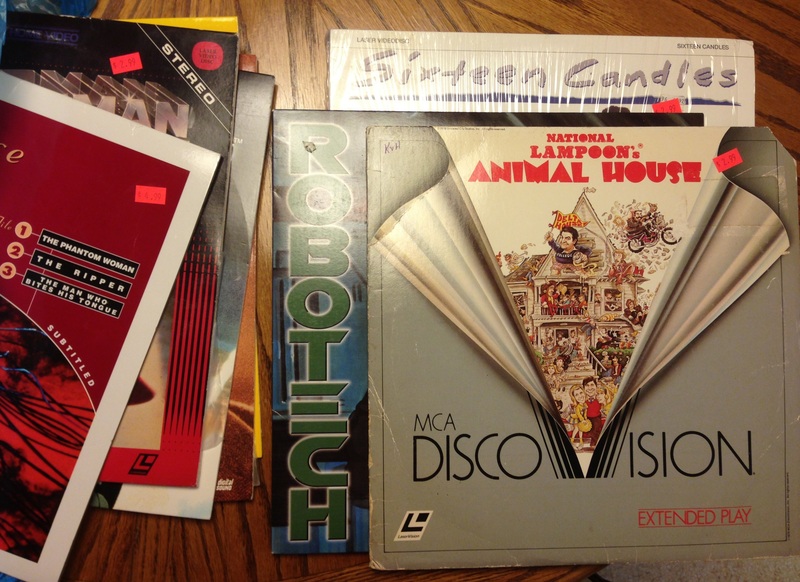 I think I spent about $20 on used LaserDiscs. That reminded me that I should write something about my LaserDisc player and my fascination with the LaserDisc format. 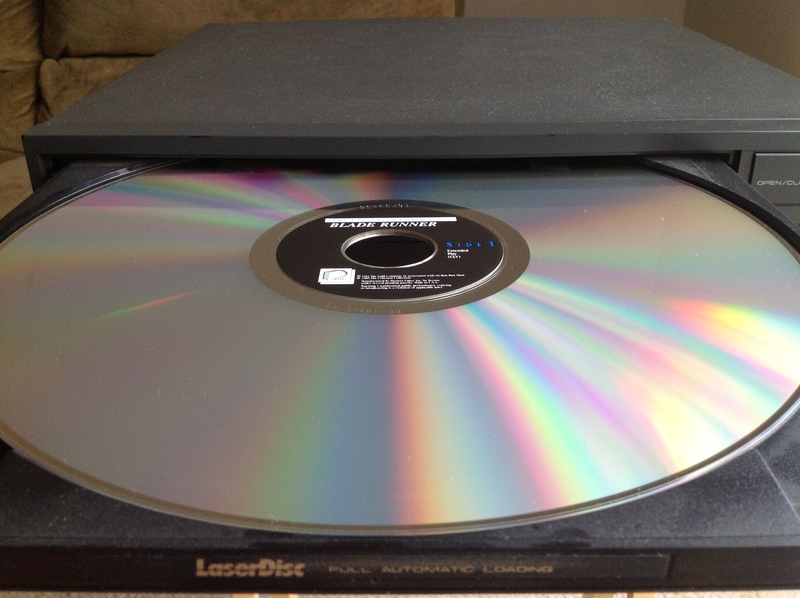 LaserDisc, if you’re not familiar with it, was a home video format active from about 1978 to 2000 that played high quality analog video from 30cm discs that resembled large CDs the size of a vinyl LP record. 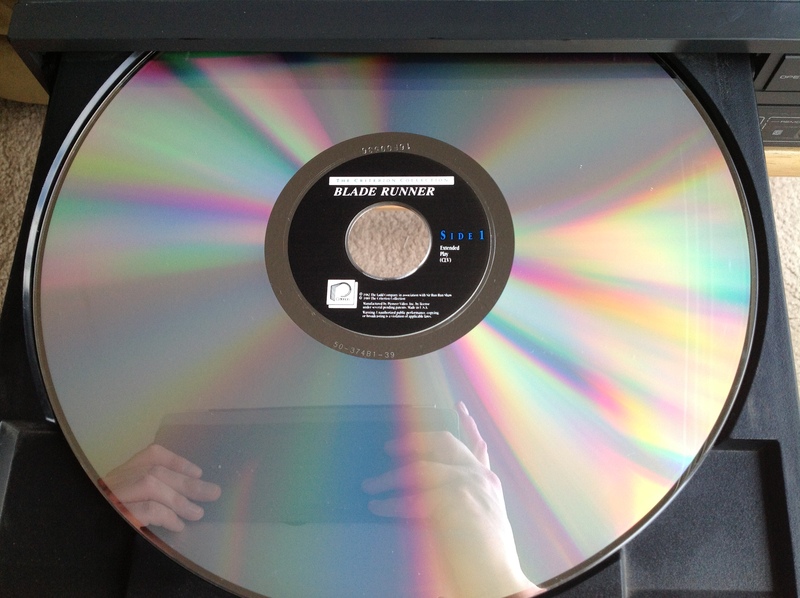 LaserDisc is sometimes described as the forerunner to DVD, but that’s not a totally valid comparison. Unlike DVDs, LaserDiscs contain analog video. The way this page puts it, the video and audio signals are combined into a frequency modulated waveform and the length of the pits and lands represents the wave on the discs. So, while the discs are physically like CDs and DVDs in that pits and lands are read by a laser, the video itself is stored as composite analog video. LaserDisc spent much of it’s life as a luxury format for film and home theater enthusiasts. It’s important to note that LaserDisc was not a failed format (like CED). Rather, it became a niche format that lasted for about 20 years while never achieving mainstream success. From 1978 to 1997 it was the home video format with the best video resolution, and after the introduction of digital audio in the late 1980s, the best audio as well. At the time the main practical criticism of the format was that it was not recordable. 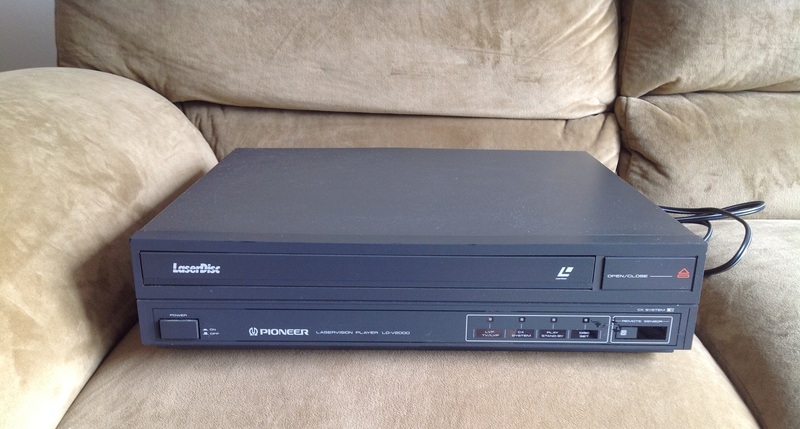 If you bought a VCR you could both record from TV and watch prerecorded movies where if you owned a LaserDisc player you probably also wanted to own a VCR for recording TV. The other prominent downside to LaserDisc was that most films required at least one disc flip. 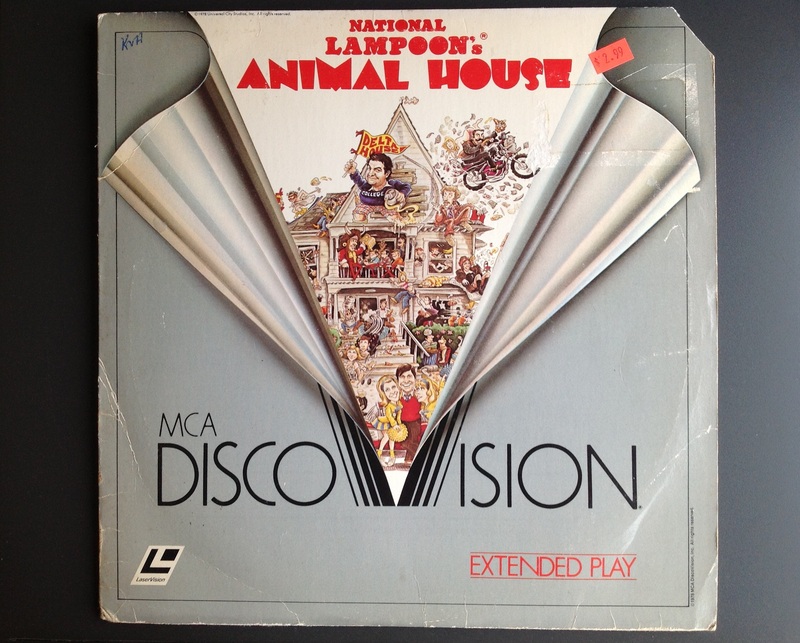 Early discs like this 1981 copy of Animal House were constant linear velocity (CLV) which meant that each side of the disc could hold 60 minutes of video and a two hour film could fit on two sides of a single disc and the film would require one disc flip. These discs are labeled Extended Play. As the format became more of a high end item for film enthusiasts more films were sold as constant angular velocity (CAV) discs, which could only fit 30 minutes per side and generally required at least two discs for the whole film, meaning many more disc flips. However, they would have had better video quality. These discs were labeled Standard Play, like this Disc 1 of Blade Runner the Directors Cut. 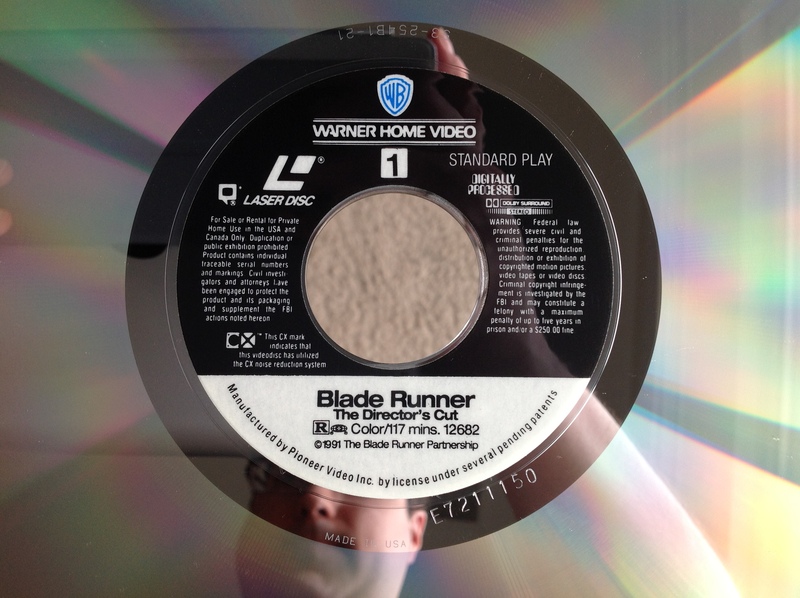 The original Criterion release of the theatrical cut of Blade Runner was on two sides a single CLV Extended Play disc but the later Directors Cut was four sides of two CAV Standard Play discs. There was also a 20cm LaserDisc size as well. Today we associate features like random access and chapters with DVD but LaserDisc had already had them for years. One notable thing for me is that fast forwarding on LaserDisc is much more slick than on any other video format, DVD included. On VHS the image would waver and distort while fast forwarding. On DVD the fast forwarding is very jumpy as it quickly shows you still frames. On LaserDisc fast forwarding feels very stable, smooth, and responsive. The most fascinating thing about LaserDisc was how the audio standards evolved over time. Originally LaserDiscs contained only analog audio. Some discs used the CX noise reduction system, like audio cassette tapes used Dolby-B noise reduction. After the advent of the CD player started supporting PCM audio as well. Discs started coming with two PCM digital audio tracks in addition to the two analog tracks (to keep support for older players that only supported analog audio). 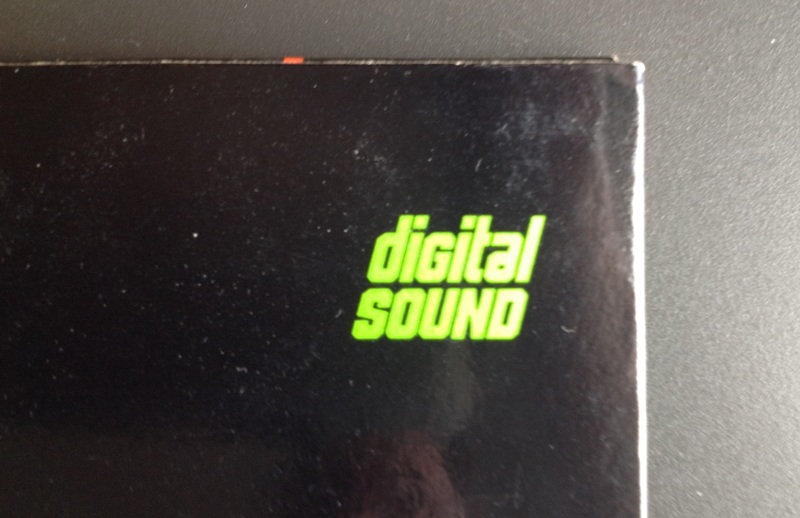 These discs carried this digital SOUND logo. About this time Philips tried to unite the LaserDisc and CD standards with what they called CD Video or CD-V. This meant they they wanted CD-V badged players to be able to play 30cm LaserDiscs, 20cm LaserDiscs, normal 12cm CDs, 8cm Mini CDs, and finally a new CD-Video format 12cm disc with 20 minutes of CD audio in an inner ring and 5 minutes of LaserDisc video on an outer ring, presumably for music videos. Some LaserDiscs, like this 1993 AD Police anime disc, carry the CD Video logo. In the mid-1990s some discs began to re-purpose one of the analog audio channels to carry RF modulated AC3 Dolby Digital 5.1 audio. These discs then carried three audio formats simultaneously: Mono analog audio, stereo PCM audio, and 5.1 Dolby Digital audio. It must have been a real thrill for home theater geeks to finally have a true discrete 6 channel surround sound format. 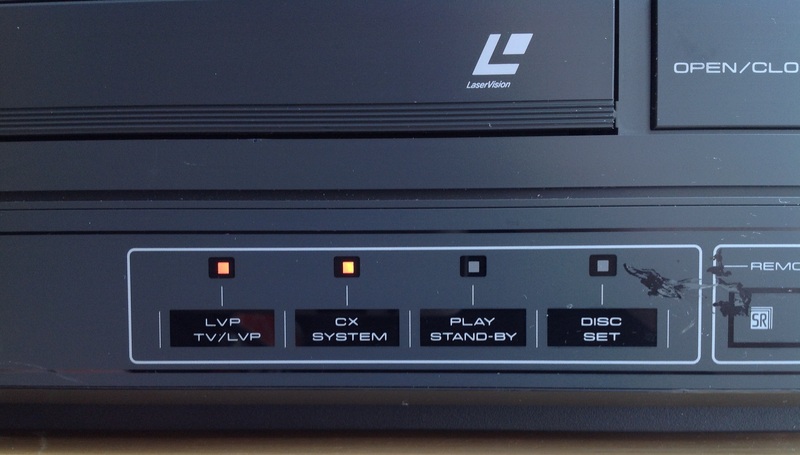 As LaserDisc players go my LD-V2000 is a very basic model and practically has none of the features you’d want to see in an ideal player. It does not automatically play both sides of the disc. It does not have a digital memory to show still frames. It does not have S-Video output. It does not play digital audio or have an AC3 Dolby Digital RF output. It does not have a fancy jog control. Basically, this player was manufactured in 1990 and the LaserDisc players that enthusiasts are really interested in were manufactured after this one in the early-to-mid 1990s. 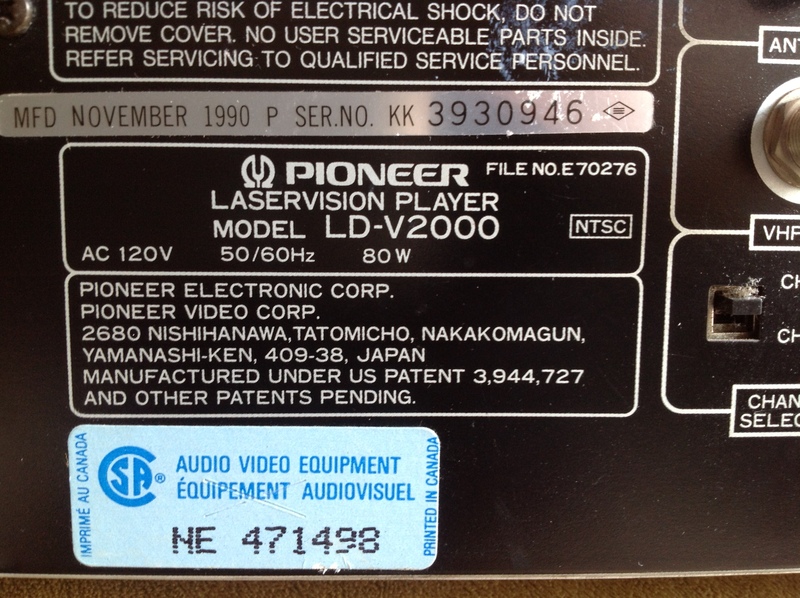 I’ve seen references that call the LD-V2000 an industrial LaserDisc player model meaning that it was probably intended for the educational or business markets. 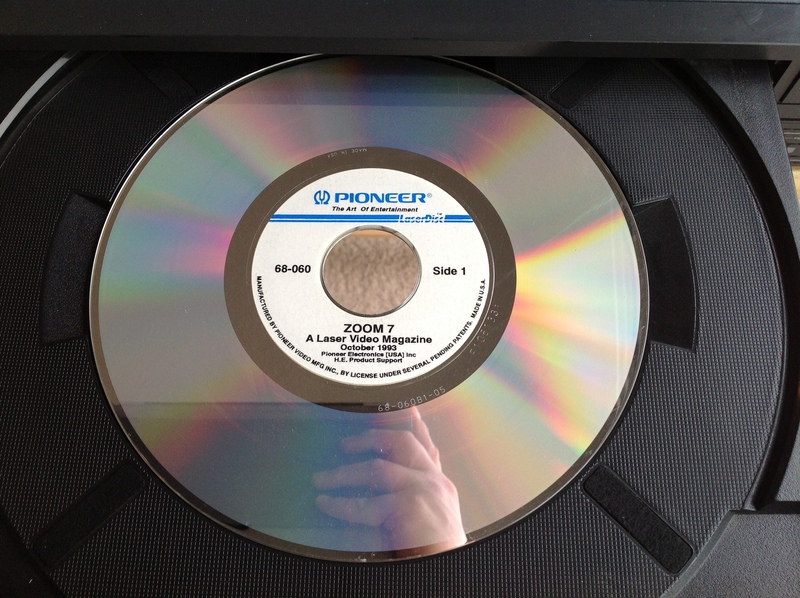 LaserDisc is an ideal format for a business situation where you would want a TV playing a video on a loop all day. I remember the ophthalmologist’s office I went to as a child had a LaserDisc player that would play Disney cartoons on a loop in the exam rooms. The idea was that kids would focus on the cartoons in the distance with one eye while he examined the other eye. I remember walking past the player in the hall outside of the exam rooms and being very impressed. 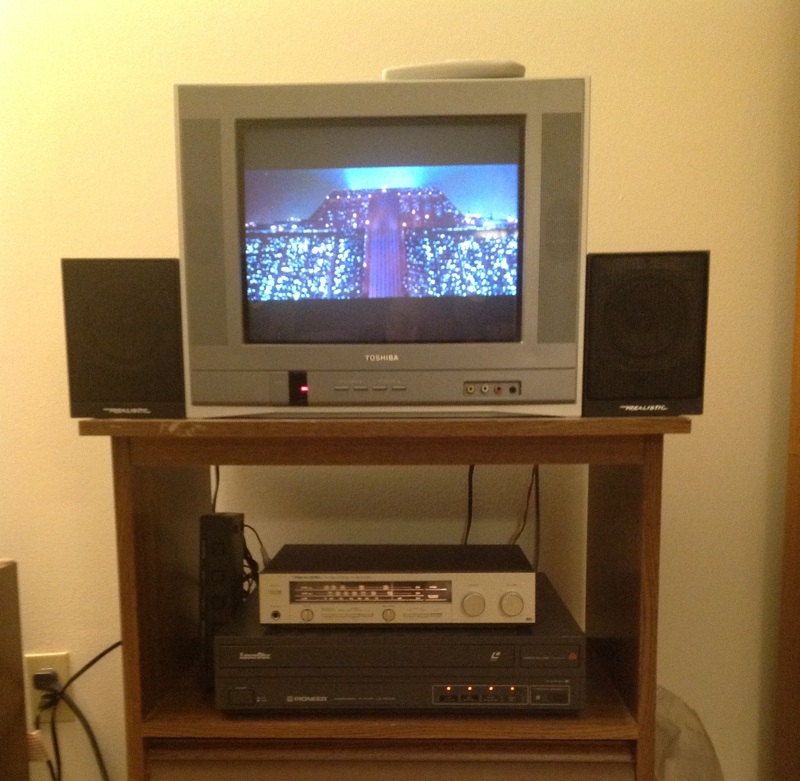 A VCR would have had to rewind the tape to play a loop where a LaserDisc player can seek to the beginning of the disc in a moment and loop the same video all day. That’s probably also why this player lacks the most basic controls on the front panel and totally depends on a remote control. This particular LD-V2000 had a medical training disc in it when we bought it. It also did not come with a remote. 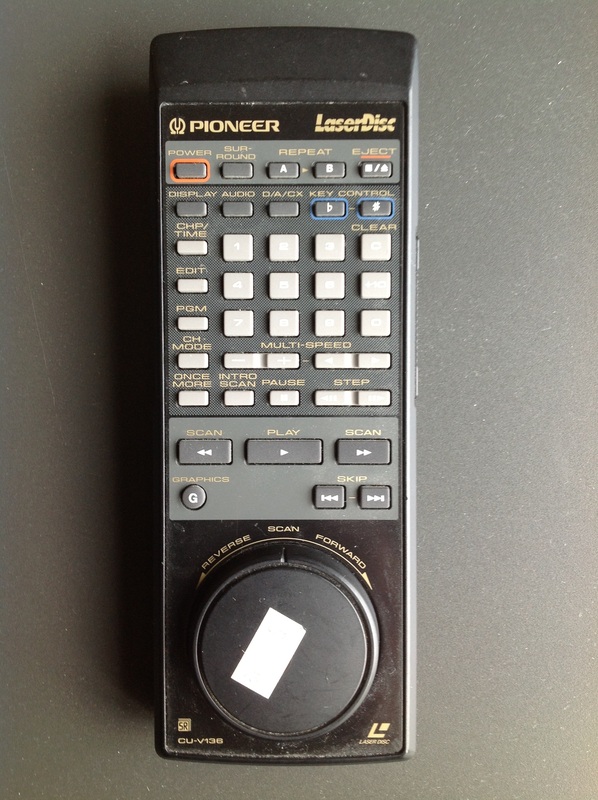 However, I remembered seeing a Pioneer branded LaserDisc remote at the now-defunct Abbey Ann’s #2 in a basket of miscellaneous remotes. It still has the $5.99 price tag on it. I was correct in assuming that it would also work with other Pioneer models, though some of the controls don’t apply to the LD-V2000. One interesting feature this player does have is an “I/O Port”, which I believe is a serial port. 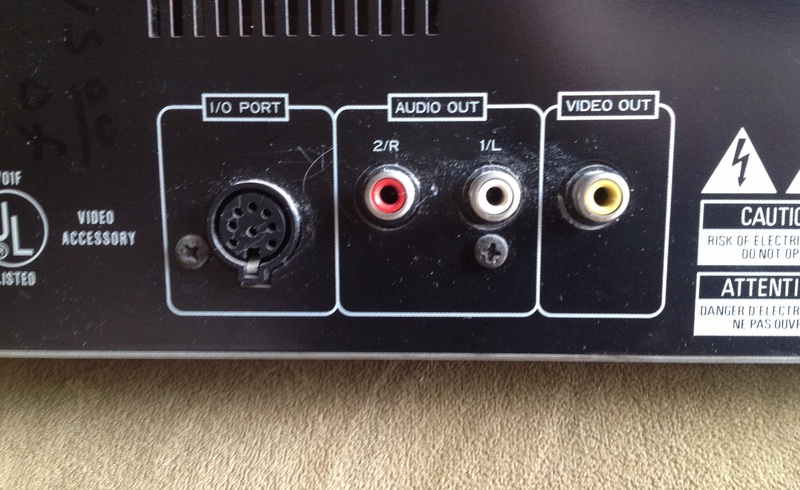 I have never seen the manual for the LD-V2000, so I have to speculate a but about what this port is for. I’m fairly certain that it’s not some sort of port that reads data off of discs. I believe it’s a serial port that allows a computer or another accessory to control the player. Since all LaserDisc were time-coded it was very easy to tell a player to call up a particular frame from anywhere on the disc. 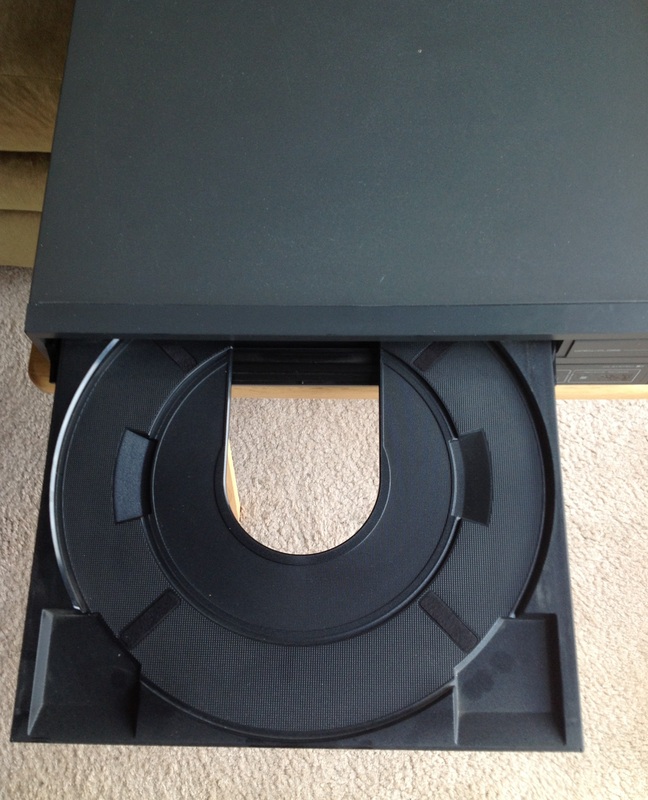 For example, there were educational discs that used a bar code reader accessory to let a person scan a bar code in a book and call up a still image or a video from the LaserDisc. You can also easily imagine a museum display where pressing a specific button would call up a video on a monitor from a LaserDisc player. So, what this player does have going for it it that it works and it’s built like a tank. I’ve been on the lookout for a player with more of the fun features people look for in LaserDisc players for some time now, but the problem is that usually someone wants $40 for it, and my sweet spot for something like this is $15. In the meantime, this simple player has been an excellent gateway into the world of beautiful analog video that is LaserDisc. the port in the back is just meant for controlling the player.. as you read in other places.. this is kind of an industrial or pro player of sorts.. so for example you could have this attached to a control system that would play from this unit.. then at the end would stop and send the signal to play to another unit and so on.. or play something from this disc.. then something from other disc.. you name it.